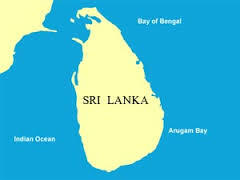 The Tamil word for Sri Lanka is ILANKAI.The Tamil word "Ilankai" has its origin in another Tamil word "Ilanku". Ilanku means "be visible". Why did the name of an island come from the word Ilanku["இலங்கு"]? Tamils are great seafarers in all known Tamil history.Tamil merchants sailed to Burma and Malaysia in the east and Greece and Rome in the west as far back as at least 2000 years.As ships sailed off from Tamil Nadu coasts or returned back home,sailors could see the large landmass of the island.It was clearly visible.So they called the island Ilankai from the word Ilanku.The island is also referred to as Ilankai in some of the oldest Tamil literature available today,for example,Sirupanattuppadai and Purananooru, both written about 2000 years ago. The Tamil word Ilankai mutated to "Lanka" in Sinhalese.The prefix "Sri", indicating honor, respect or reverence, was added to it and the island is today called Sri Lanka.This term it is quite old.Cilapathikaram, the Tamil epic that deals with the history of the Kannaki,the Pattini venerated in the Sinhala Buddhist tradition,narrates how Gajabahu brought the Pattini cult to Sri Lanka. mentioned as Jumbukolapatuna. Patuna is equivalent to pat’in’am, ‘coastal town’ in Tamil.This expression is peculiar to Dravidian speaking areas. So, this place must have been a predominantly Dravidian settlement.